What a delight and what charisma! Mariza had the audience spellbound with her Fado songs, and bits and pieces of her life for almost two hours with no intermission. She even went around the orchestra section as she sang, and had the audience participating with her songs, joking a lot of times saying, "I hear only the Portuguese and Brazilians singing". Although the majority of the audience who were not Brazilian or Portuguese didn't understand the lyrics, her gestures and her stage presence mesmerized the audience at the one-night-only concert sold-out house at the Chan Centre. Such rapport with the audience! After a standing ovation, she went on to sing two more songs, and the funny thing is the audience didn't go away as if waiting for more songs. It was after the two-hour mark that she bade farewell, but stayed around to autograph her cds at the lobby. 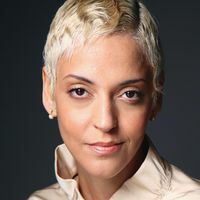 Mariza was born to a Portuguese father and a mother of partial African heritage in Mozambique. At age three, her family moved to Metropolitan Portugal, and she was raised in Lisbon's historic quarters of Mouraria and Alfama. While very young she began singing in a wide variety of musical styles, including gospel, soul and jazz. Her father strongly encouraged her to adopt fado; he felt that participating in the traditional music would grant her greater acceptance in the Portuguese community. Mariza has sold over 1,000,000 records worldwide.